The Opinionated Gamers have been talking about games long enough, it’s high time to peek behind the curtain and actually see some games! 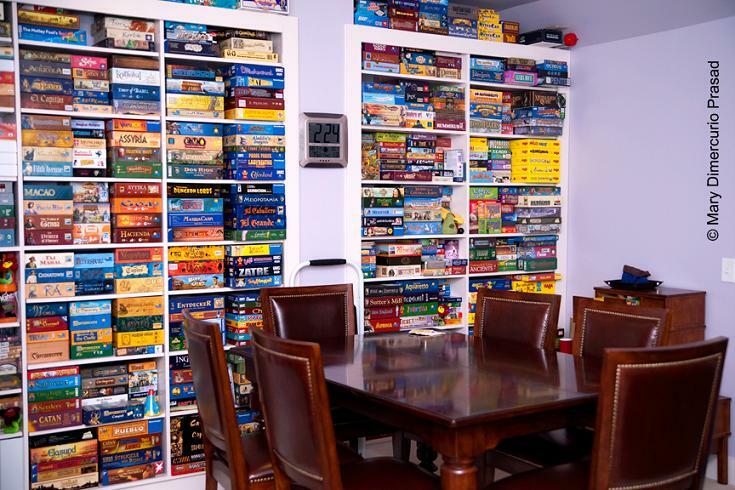 We’ve got quite a variety of opinions on games and a similarly large variety of storage solutions for our games — from sideways to stacked horizontally; from proudly displayed to tucked away; from color coded to publisher sorted. 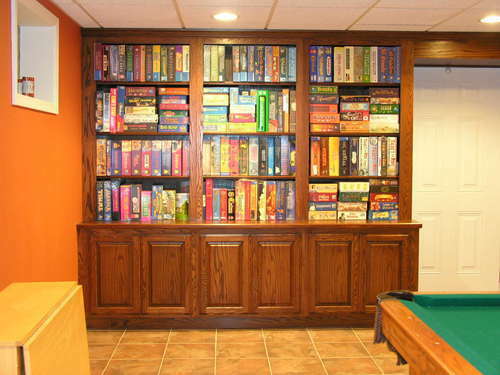 Now presented in all their geeky glory are the gaming cribs of eleven Opinionated Gamers. 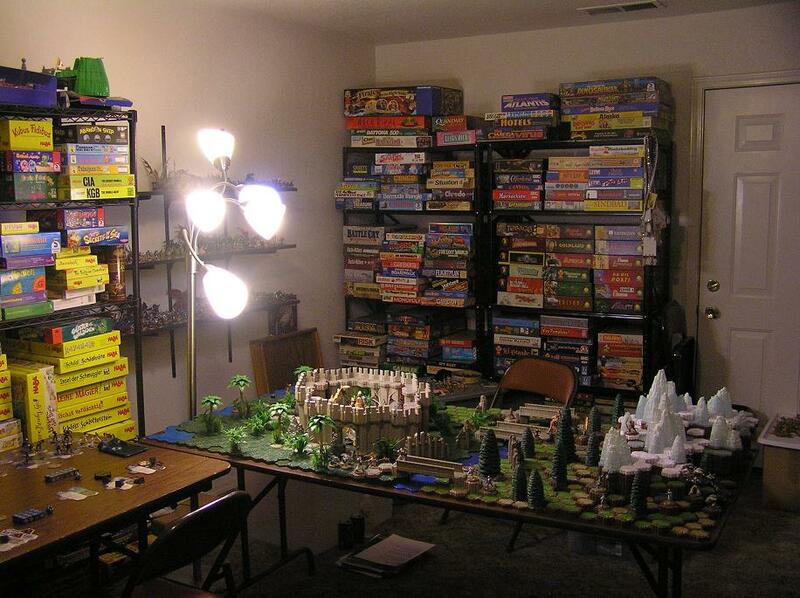 First off let’s head to West Virginia, where Ted Cheatham has setup a loooooooong wall o’ games. He’s even got some snacks in there in case you’re hungry. In the foreground you can also spot a copy of Kapitan Wackelpudding, a breed rarely seen in the wild but magnificent in all its hilarious glory when spotted. Next we head out west to California where the “Fluff Daddy” himself presents a giant room of gaming goodness. 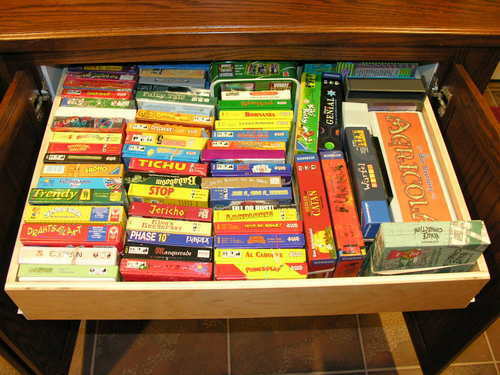 Mark has written a number of kids games reviews for Opinionated Gamers, so it’s no surprise that you see Haba games left and right in his crib. 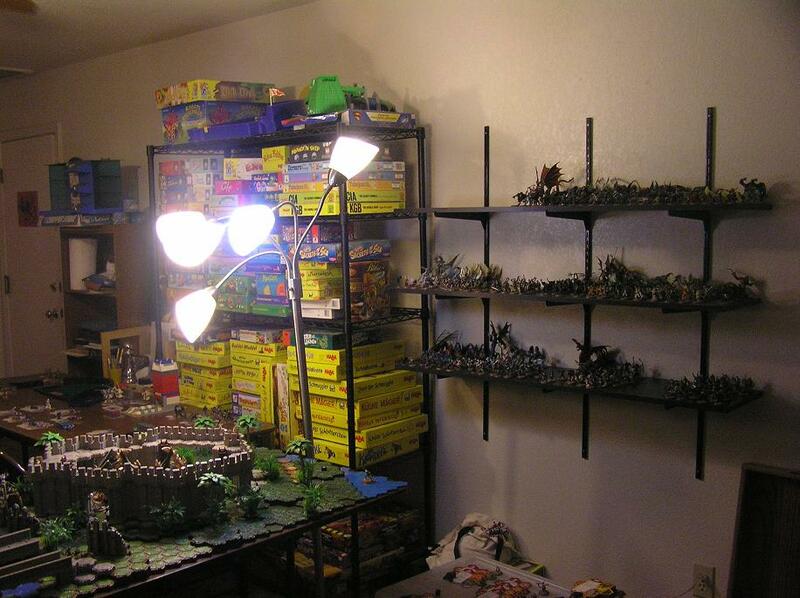 There’s also an impressive HeroScape setup to admire. 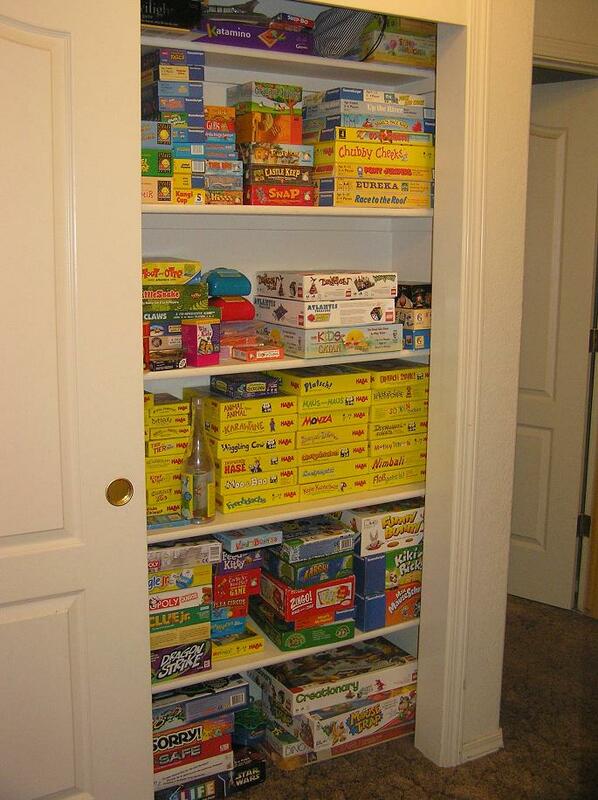 Lastly, you see here Mark’s closet with even more kids games! 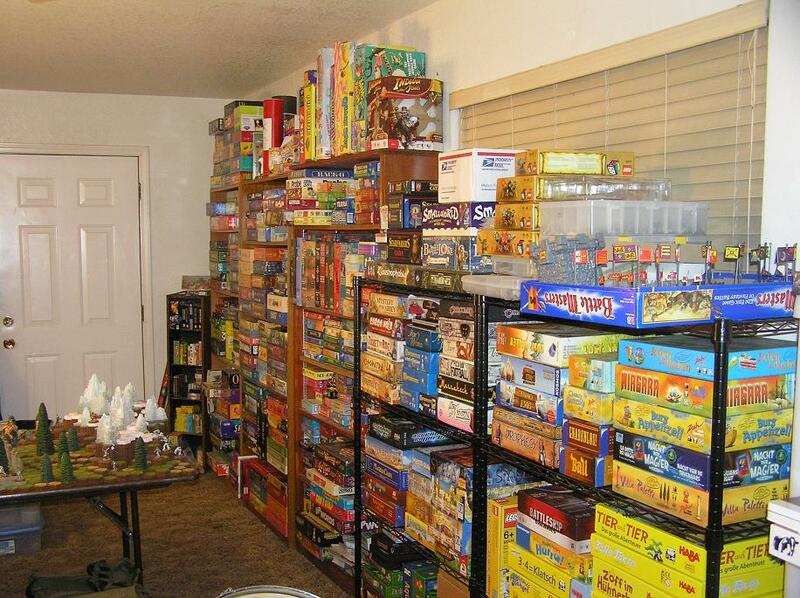 That’s more Haba games than you can shake a stick at. Now we head across the pond to Jeffrey Allers’ crib in Germany. Jeff has been mailing it in for years with his fantastic Postcards from Berlin series so now it’s time for us to return to sender and visit his pad. You can spot a couple of Jeff’s own designs in there if you look hard enough. 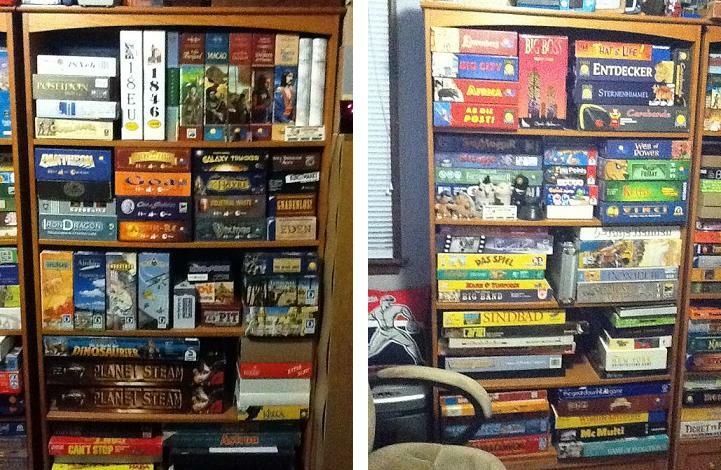 You know he’s got good taste because he’s got Galaxy Trucker and Twilight Struggle sitting there within easy reach. There they are! Watch out for the piranhas. Lastly, what game designer’s crib would be complete without drawer upon drawer full of game bits. Check out those bits! 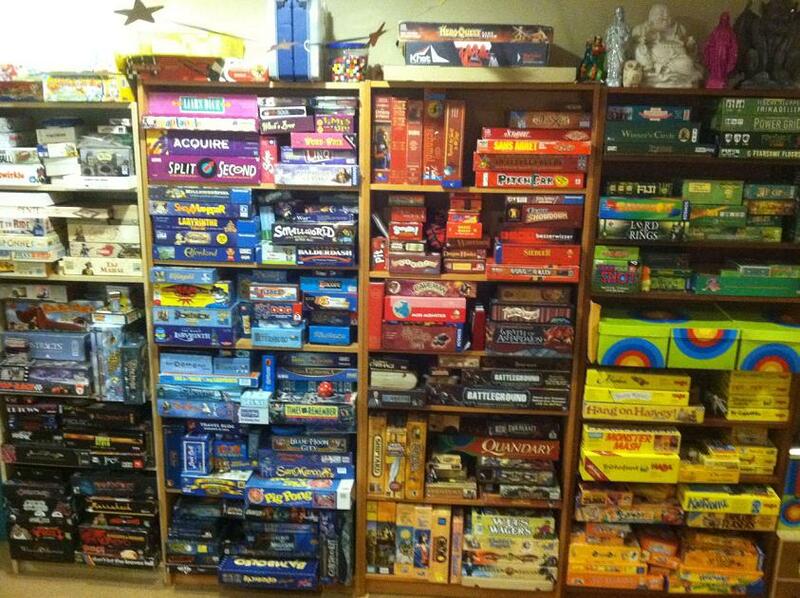 Next up we head back to the U.S. of A. where Mary D. Prasad shows off a beautiful wall of games. In Mary’s recent Halloween piece you can see the outside of her home (or should I say castle), but here are the goods we gamers really care about. 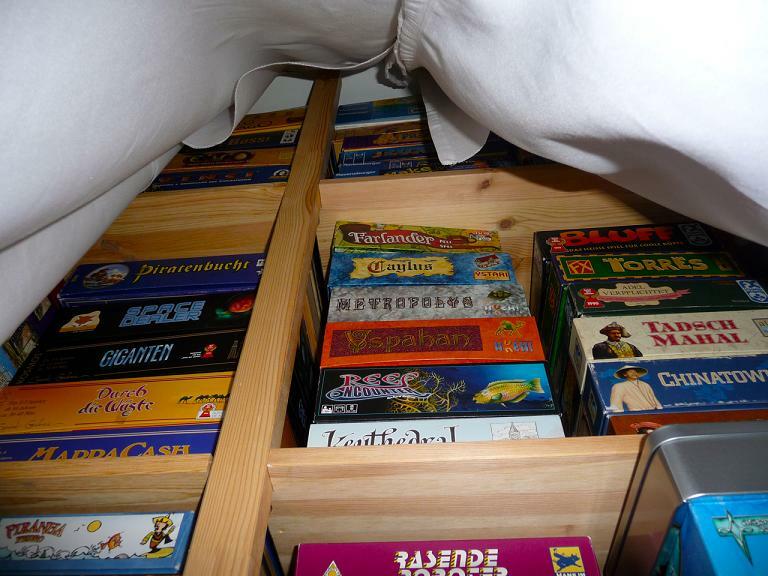 It looks like one of Jeff’s games snuck back in our luggage and snuggled up right next to Herr Rosenberg, perhaps it was smuggled in that copy of Hart an der Grenze hiding underneath the speed puzzle game that literally gave me nightmares, Ubongo Extreme. Speaking of beautiful, check out Nate Beeler’s crib. Whoa, that’s a double rainbow all the way across! That’s so intense. Oh my, it’s full on! It’s so beautiful, what does it mean? To top it off, this is what you first see when you enter Nate’s crib. Note that the mustache was added later, obviously to make him look more dignified. Phew, that was intense. 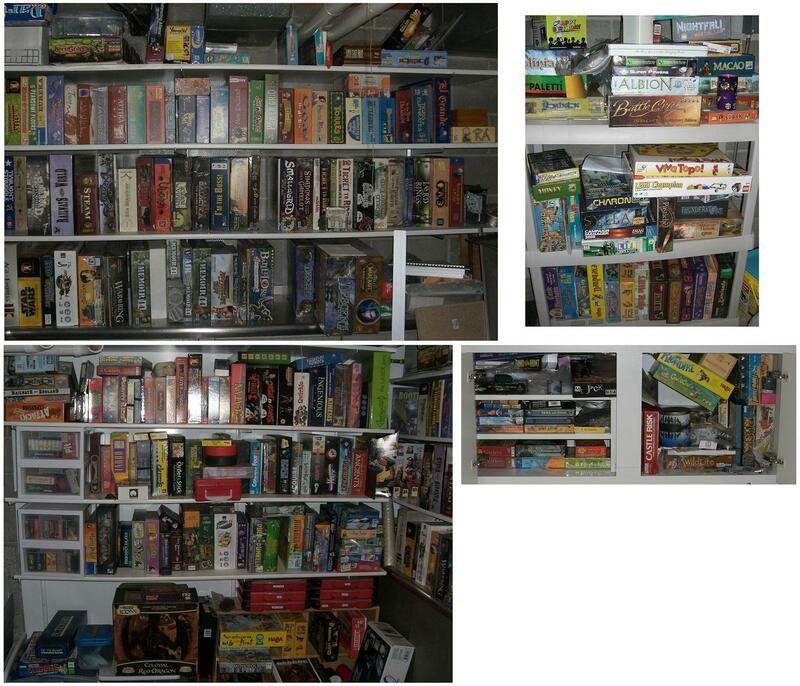 Alright, back to reality where Joe Huber shows off a fully stocked four bookcases loaded up with games. Is that two copies of Planet Steam I spy there, not to mention Big Boss and McMulti. Down below you’ll spot the original versions of Carabande, Snow Tails, and Factory Fun – someone gets in on the ground floor! 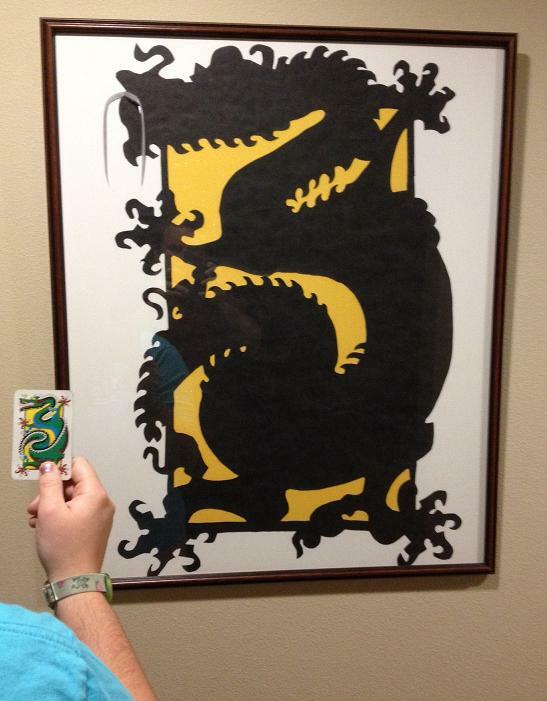 Heading out to the “Crossroads of America,” Matt Carlson shows us a collage of gaming goodness. 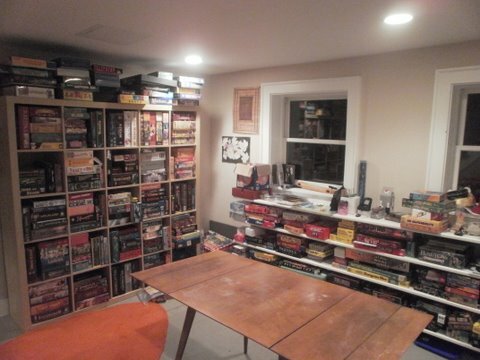 It turns out the man behind all of the in-depth iBoardgaming articles actually has physical games, and lots of them. He’s got Gulo Gulo and Cash ‘n Guns, you’re sure to have a good time! Traveling just a short way over to the east coast we come upon Tom Rosen’s new crib. Tom’s crib can be seen through some time lapse photography through these dated pictures and these even older ones. 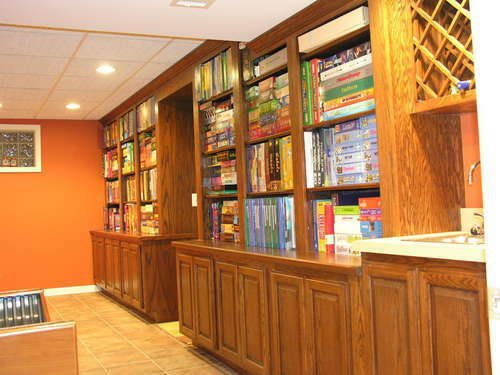 Having recently moved into new digs, below is Tom’s dedicated game room with a built-in and room to grow. Just look at those gaming tastes, impeccable! A hop, skip, and a jump away is Larry Levy’s crib… but what’s this? Larry doesn’t own a digital camera! I suppose they may not allow such new-fangled technology in his retirement community. 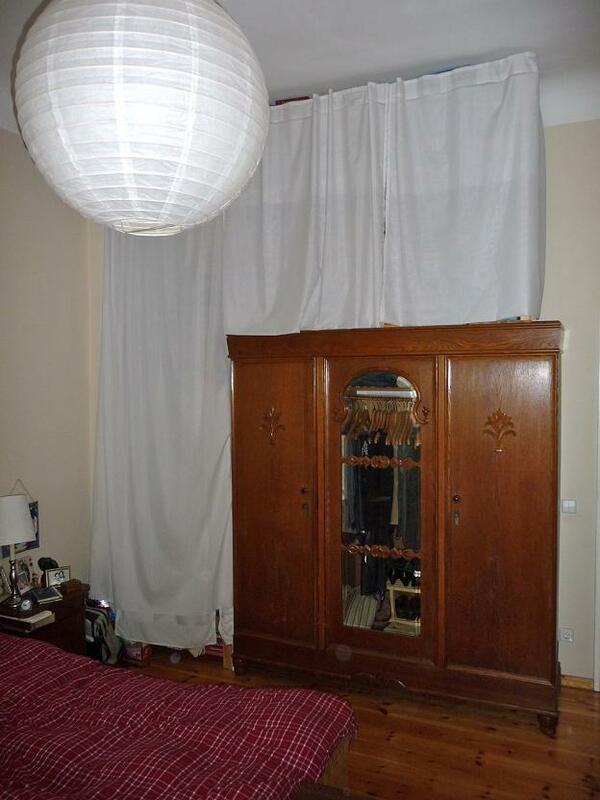 Either that or his crib is just too wild for photos on this family site. Hopping on a cross-country flight, we arrive at Jonathan Franklin’s west coast crib. 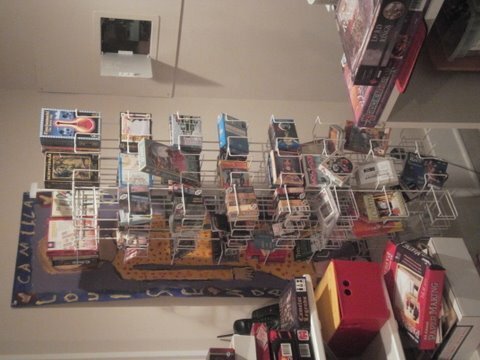 Jonathan’s got a solution to that ever vexing problem of what to do with small card games — he saved a large greeting card rack from a store that was discarding it. And he filled it with Scripts & Scribes, good call! Our penultimate stop on this tour keeps us on the west coat where Mr. Board 2 Pieces has quite the all-encompassing game room setup. 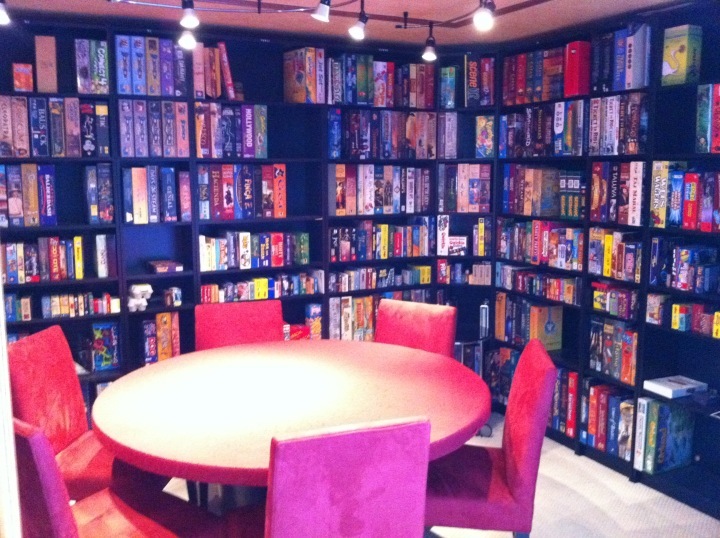 He plops his guests in comfy chairs and completely surrounds them with games, ingenious (or should I say einfach genial)! Lastly, we end this tour at the house of our fearless leader, Dale Yu – the brains behind this operation, for better or worse. Dale has quite the basement crib, complete with real crib gear like a pool table and a giant flat screen TV. We’ll start with a wide angle shot and then zoom in for a closer look. And thus concludes our whirlwind tour of the Opinionated Gamers’ cribs. 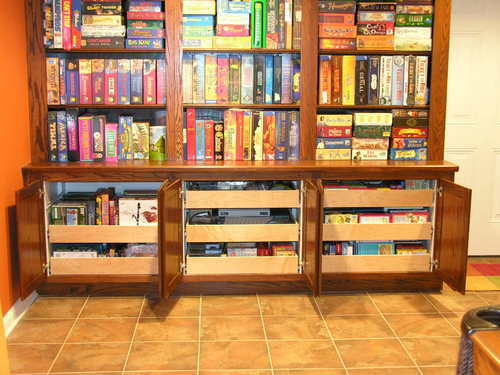 We’ve traveled the globe in search of the perfect game storage solution and it seems there are countless different ways to store your games. 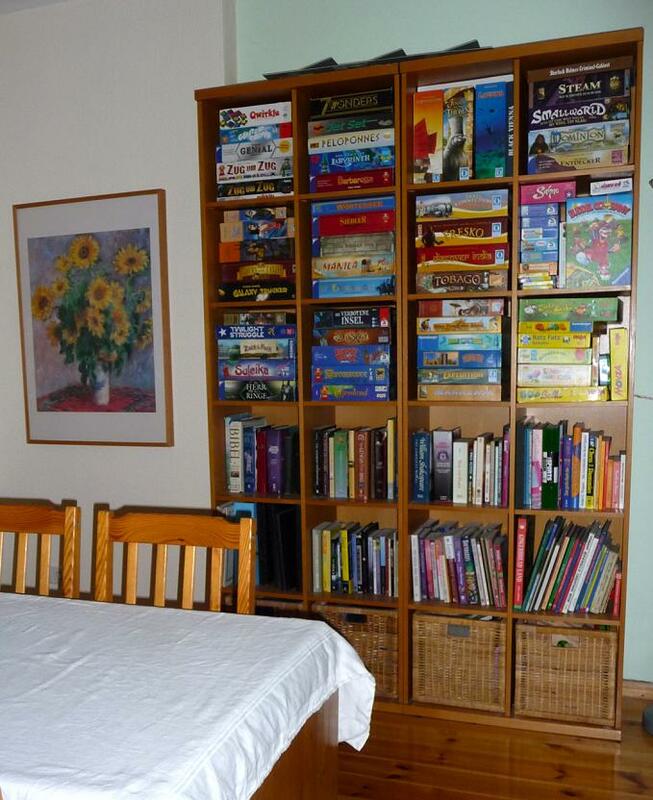 Cribs of all shapes and sizes and systems do the trick, as long as they’re packed with games! Amazing displays guys! Thanks for sharing! I want Ted’s lighting system for his table. My “what’s the cheapest lamp I can buy at Target?” method stinks. Mark, I got some fairly cheap lights at IKEA…two sets and then just mounted them on the ceiling in place of the original dining room light. Ted: living as I do near the frontier edge of civilization (aka Fresno), I actually have to drive to the East Bay to find an Ikea. And then there’s that pesky “brilliant at some things but not installing electrical items” problem. Seriously, though, thanks for the tip (for me & for others). 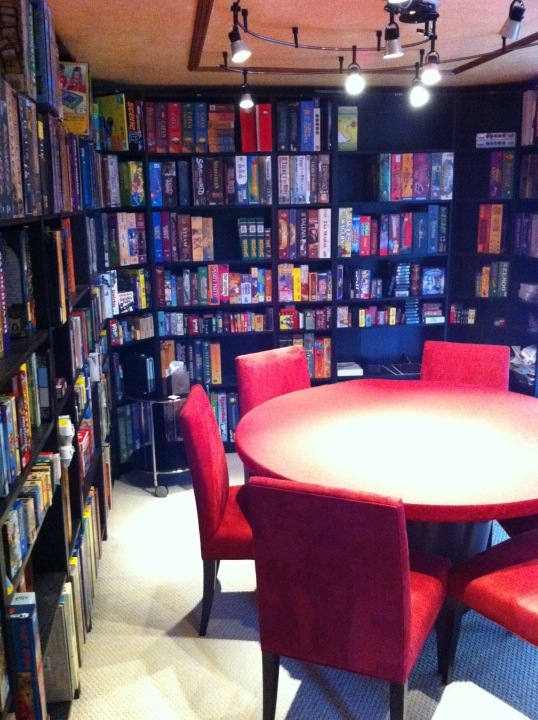 Light ON the table is always a big issue for game rooms. 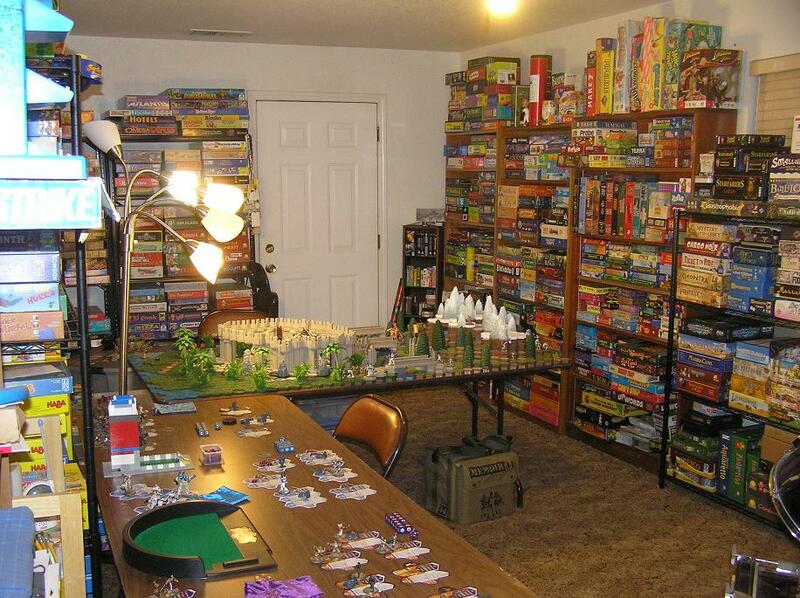 Wow – you guys own a lot of games :-). Very impressive collections. 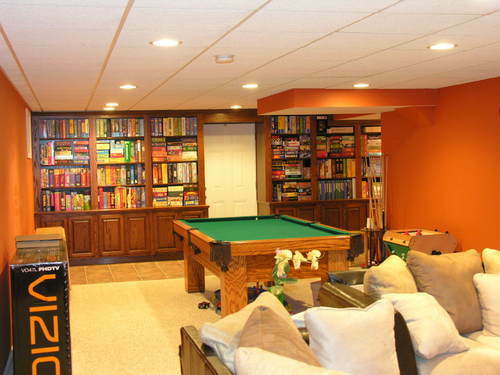 Dale – Your basement looks awesome. 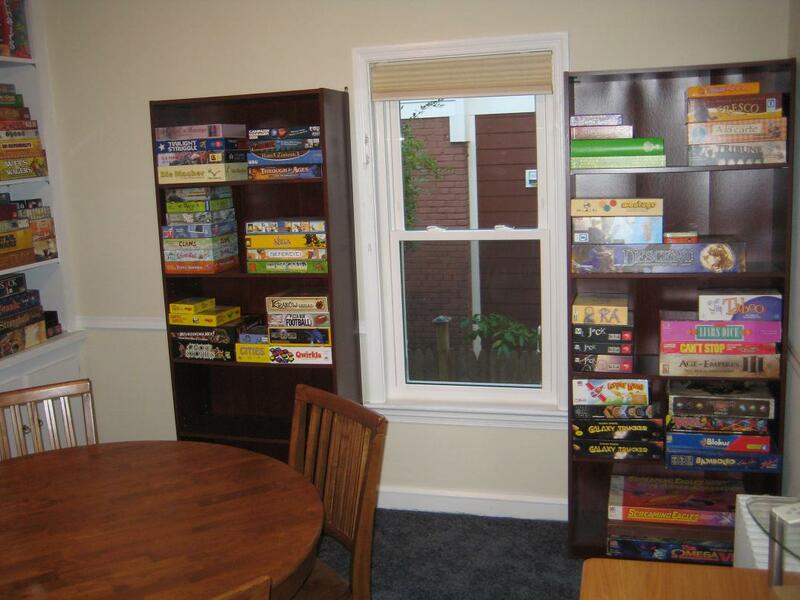 I can say that I have 7 IKEA Expedit full of games on top floor (where I have my office). Than I have something like 2-300 boxes along the stairs coming down. The new arrives (usually 10-20 boxes) in my bedroom … than the 30-40 most played games in family in the living room shelves. 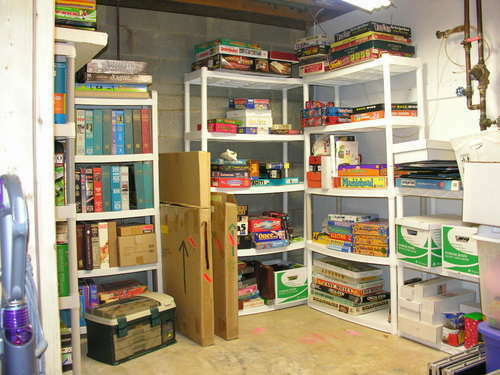 I have than 4 shelves full of games in the cellar. 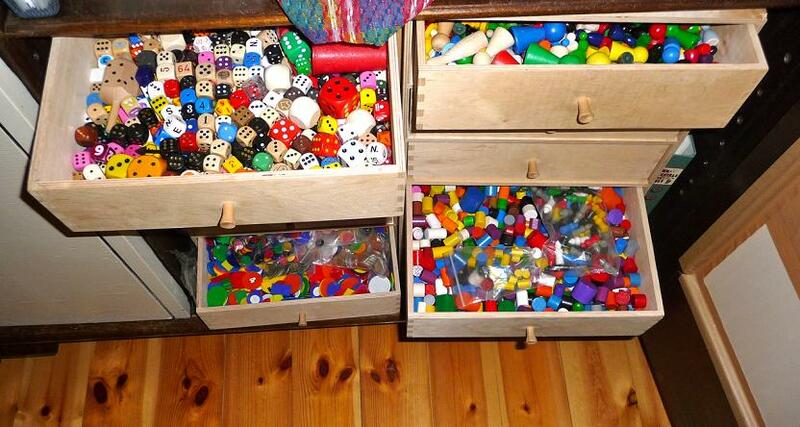 Of course HABA, Selecta and other kids games are all around the house, actually where Francesco played the last time! 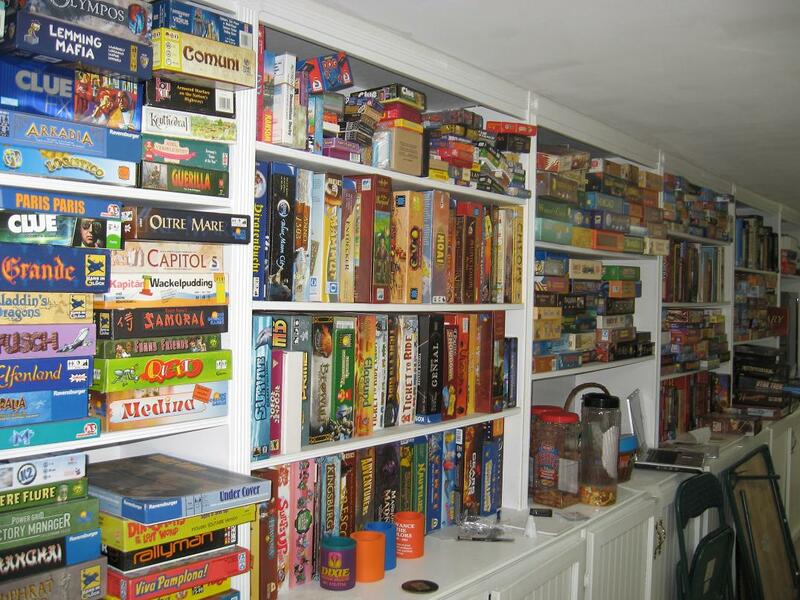 The things I like most are the pile of games along the stairs … all the time I’m moving from down to up or up to down I just stop to see the games in the piles! Those are definitely excellent collections. Yet I come away from looking at those cribs wondering if there is no aesthetically pleasing way to display game collections. Ted Alspach’s setup caused me to cringe the least. 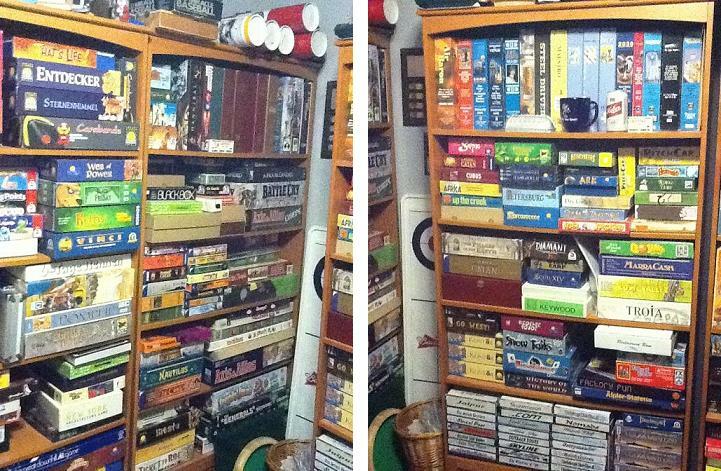 I have one bookshelf of games and it is an equal eyesore. Oh wow, really? 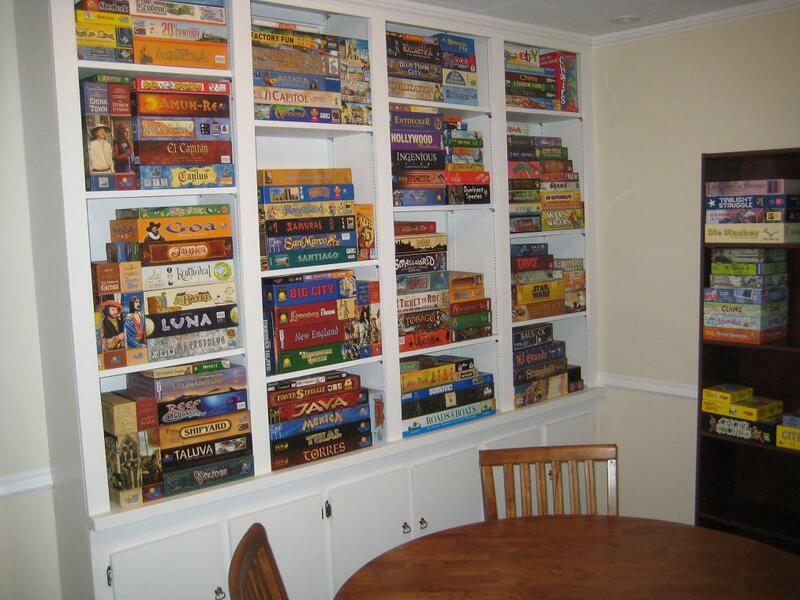 I’ve always thought game shelves looked really aesthetically pleasing personally. They’re so colorful and nice to look at I’ve found. I suppose, de gustibus non disputandum est. Okay. So I am admittedly drawn to a minimalist aesthetic. So maybe I should be more precise. There is no way to organize and display them in a way that works with that kind of aestheic given that in the they are just hundreds of boxes.